I have observed a pattern from multiple enterprises moving from a traditional web app to a SaaS. Trying to capture this pattern and a number of lessons learned. I use a J2EE Web App architecture to illustrate but the same principles apply to other technology platforms. 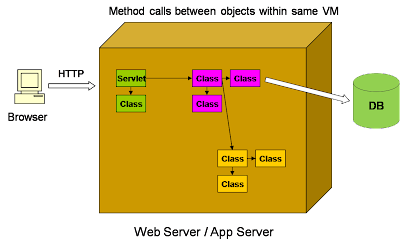 We analyze the functions and partition them into different processes (JVM). 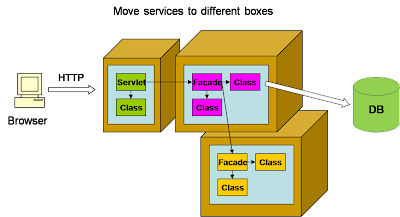 The partition needs to be coarse-grain and each process will communicate with each other via a service interface exposed by a Facade class. 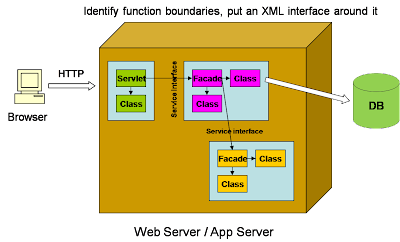 The service interface can be any remote object invocation interface or XML over HTTP. Restful web service is the de-facto way for the service interface. To scale out beyond a single server's capacity, we move the process to a separate machine. Notice that the machine can be a physical machine, or a virtual machine running on top of hypervisor. If the service itself is stateless, we can easily scale out the service capacity by putting multiple machines (running the same service) into a server pool. 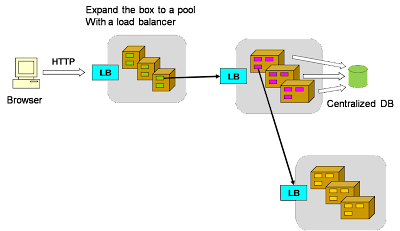 A network load balancer will be used to spread the workload evenly to the member servers. When the workload increase, more machines can be added to the pool to boost up the overall capacity of the service. Elastic scalability provided by Cloud computing provider make growing and shrinking the pool even more rapid, and can hence dynamic workload more effectively. After we scale out the processing tier, we found the data tier becomes the bottleneck. So we also need to distribute the data access workload by partition the database according to the data key. Here are some classical techniques how we can build a distributed database. 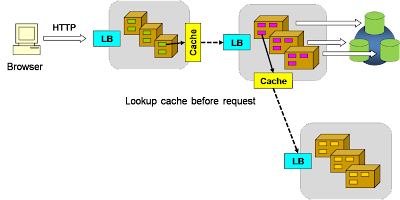 If the application is has a high read/write ratio, or has some tolerance of data staleness, we can add a cache layer to reduce the hit of the actual services. Clients will check the cache before sending the request to the service. We need to make sure the cached items to remain fresh. There are various schemes to achieve this. e.g. cached items can be expired after certain timeout, or an explicit invalidation request can be make to specific cached items when the corresponding backend data has been changed. 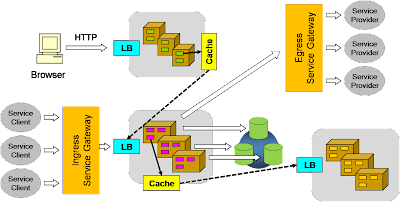 We can use local cache (reside in the same machine as the client) or a distributed cache engine such as Memcached or Oracle Coherence. At this point, we want to expose some of the services to the public either because this can bring revenue to our company or can facilitate a better B2B integration with our business partners. There are a lot of considerations to decide what to be expose, such as security consideration, scalability, service level agreement, utilization tracking ... etc. Once we decide what services to be exposed, we decide to use a specialized ingress service gateway to handle the concern that we outline above. Most of the XML service gateway is equipped with message validation, security checking, message transformation, routing logic. We not only providing service to the public, but may also consume other public services. In this case we deploy an egress service gateway which can help to lookup the service provider endpoints, extract the service policy of the public service providers ... etc. My service will evolve after exposing to the public. In the ideal case, only the service implementation change but not the service interface so there is no need to change the client code. But mostly likely it is not that ideal. There are chances that I need to change the service interface or the message format. In this case, I may need to run multiple versions of the services simultaneously to make sure I am not breaking an existing clients. This means I need the ingress service gateway to be intelligent about routing the client request to the right version of the service implementation. A typical way is to maintain a matrix of version and keep track of their compatibilities. For example, we can use a release convention such that all minor releases is required to be backward compatible but major release is not required for that. 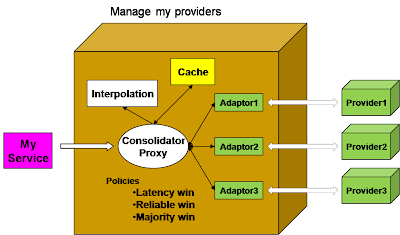 Having this compatibility matrix information, the ingress gateway can determine the client version from its incoming request and route it to the server which has the latest compatible version. Purchase necessary hardware equipment and maintaining them can be very costly, especially when there are idle time in the usage of computing resources. Idle time is usually unavoidable because we need to budget the resource at the peak workload scenarios so there are idle time at non-peak hours. For a more efficient use of computing resources, we can consider some public cloud provider such as Amazon AWS or Microsoft Azure. 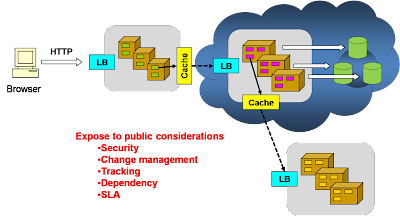 But it is important that running an application in the cloud may need to redesign the application to cope with some unique characteristics of the cloud environment, such as how to deal with high network latency and bandwidth cost, as well as how to design application to live with an eventually consistent DB.